So, what's on for this month? Revelation that Malice is Alice's twin sister? Revelation that Malice is Alice's spurned wife? The Praeses sent the two of them down for peace and quiet and DON'T want them back? We run into Alice and Malice's Mom - and she's NOT happy! More weird and wonderful creatures for Ardent to play with and Gaiva to freak out over? Gavia walks more than 100 yards, unassisted by nano? Whatever it is, it ain't in this Poll! Alice is sleeping in her armor. That implies something about her relationship with Sedna right there. That, or the armor disintegrated her clothes when it, uh, apparated? manifested? materialized? Whatever it did. Sedna didn't hesitate to let a woman whom she claims to hate sleep beside her; is that the result of bittersweet memories? As Jeph says in his endnote - They have a weird relationship! Sedna's earlier denial to Ardent aside, I'm taking panel 4 in this strip as proving that she and Alice have some kind of common origin. If not some kind of common relationship. Familial or otherwise. It shall be interesting to see which. There's no sign of Alice's tee-shirt or dungarees, even though she's got the armour open almost to mid-chest. Yeah, it disintegrated her clothes alright! I can imagine what will happen when Ardent figures that out. I'm going to hazard a guess the armour consists of the atoms that were formerly her clothes. And it's a one-way transformation so she's stuck until she can get new dungarees from somewhere. Prediction: once the gang begins traveling with a well-armed Sedna, Predator will be hunting them. Sedna, on the other hand, might not be wearing anything. Her top is definitely gone. If that's true then my indecision is gone and I'm pretty certain they were a couple. Siblings don't tend to sleep with another who's not wearing anything. There are other options besides couple and related, you know. They are the only ones we've seen, possibly the only ones they know, who are from before the Blink. Though Alice did allude to the fact that there were other sources of information she could have gone to, but Sedna was the closest. So she went to her, instead of a more preferred source. That doesn't necessarily mean they are of similar vintage to these two. But the sheer commonality of being immortals in a human world would draw them together. Nobody else could understand them as well. Unfortunately, understanding doesn't equal friendliness. Sometimes quite the opposite. Which is a long way around saying they may have just been friends, or acquaintances who shared a similar background. Think more military buddies than sisters or lovers. You seem to be forgetting the fact that Sedna knows Alice well enough to know exactly that Alice hates herself. And also a feud that's gone on for 300 years which neither of them have, or at least had intention of breaking. People don't tend to know eachother so well, and at the same time hate eachother so much that they'd never see eachother in so long if they were nothing more then military buddies. Alice probably kindly gave up her claim to Sedna's only spare pillow so that Ardent could use it. Sedna was clearly willing to do the same for Gavia. This suggests a strong instinct of kindness in both the older augments. I don't think that not having a pillow is going to matter as Alice and Sedna are going to wake up in a spoon (heads on the same pillow). They will react with much embarrassment, quietly blame 'long habit' and agree to never mention the event again. Interesting that the grudge between them is only 300 years old though. I took that to mean merely the last time they met, not the origin of the hostility which could even have been in the immediate aftermath of the blink. No, it's only been 300 years. The line '300 years and you haven't moved on' in relation to the grudge makes no sense if she had just meant since the last time they met. Cause if the grudge had been going on for 5000 years then why should Alice be surprised or whatever reaction that is, that in 300 years she hadn't moved on. Especially in combination with Sedna saying how this comes from the queen of grudges. I'm beginning to get a hint of what Alice is about. Remember her PTSD flashback when she was about to kill Ardent? I think that she did things in the Great War; things that no sane person could do without leaving permanent scars. I suspect that Sedna spend centuries trying to get Alice to move on but couldn't. In the end, she couldn't hang around whilst Alice was continuing her self-imposed penance. For the sake of her own sanity, she had to leave and find her own life. The problem? She still loved her and it's hard to forgive the woman who broke your heart. The irony? 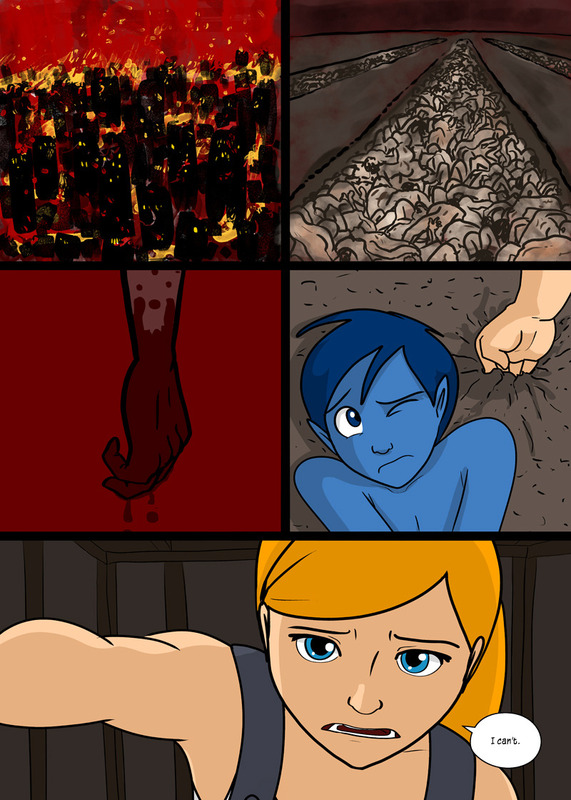 I bet that Sedna giving Alice the "I can't do this anymore, Ali. I've tried but I can't just sit here anymore and watch you trying to find some way to kill yourself or at least make yourself suffer forever. I have to get out of here before it kills me!" speech may have done the trick. I bet that Alice helping the Townsfolk originated with the shock of Sedna walking out on her and realising that she was right and that just sitting there and trying to will herself to death was stupid and wrong. Is it just me, or does anybody else think it'd be cool if Jeph started updating AG once per weekday, and took QC down to once or twice per week. I think AG would drop in quality without enough of a boost in QC to make up for it. Oh my god I'd love if Alice said something on the townsfolk part of what you said in the next page. I see where you're coming from, but I don't think this is right. It'd definitely be cool to get Alice updates more frequently, but this is a storyline in which every strip, every panel, gives significant information about this new world about which we are still learning. QC is a universe much closer to our own, which characters several years more established, and so surely does not consume so much effort and thought in story creation and story telling. I suspect that Alice Grove needs its slower pace. Incubation time is invaluable in any setting, but certainly so much more in a creative sense such as this where you have potential to take a story anywhere, but never to recant upon a mistake. The Alice story is intriguing, rich, and I feel it would be diluted to impose a time deadline that might obstruct any process of incubation and pondering over its complex canon history. A query: Would readers agree or disagree with Alice, Sedna, Ardent and Gavia being described as 'trans-humans'? Oh, they're all transhumans, in that they clearly have all been modified from natural homo sapiens. The townsfolk, as far as we know, are still unmodified humans. The question is, at least for Alice and Sedna, whether they were modified by others or if they're simply mutants. I think we still can't be sure if they are humans at all, in any sense other than appearance. They might be really advanced droids, shapeshifters, or something else entirely. I'm pretty sure that Ardent and Gavia are transhuman. Post human would imply they have moved away from human baseline as a species. Gavia and Ardent, while they are siblings look dramatically different than each other because of their individualized upgrades. And Gavia pretty much looks like one of the villagers we've seen, aside from her nanotech powers and clothing. Ardent on the other hand looks significantly different, but still mostly human. Alice and Sedna though, we have no idea what their origin is yet. We know they are of pre-Blink vintage, nearly impossible to damage physically, stronger and much faster than a baseline human and apparently unaging. They do seem to require food and sleep though. It seems unlikely that Alice would fake it just for the sake of the villagers or the siblings. And Sedna has a bed, even though she apparently lives alone in a remote place. They could be highly modified or engineered humans. They could be advanced androids made to mimic humans closely. Judging by Alice's flashback and her armor they seem to have been intentionally made as weapons during the war, and not some effect of the Blink itself. In the end, there is way to much about their origins left unsaid to say definitively what Alice and Sedna are. All we've seen so far really is what they can do. Or the Townsfolk are Eloi and Alice's main job is keeping the Morlocks away. Sedna's probably shot all the Morlocks by now. The Morlocks have bulletproof vests. And Sedna has (or at least had) antitank rifles. I think Sedna wins. Hmmm. Is the swarm just going to followthem, or will it become a genuine threat? Um... Sedna? Do you have any EMP cannons in your collection. I ask only because I think that The Night Walker has reached a decision about what to do with Gavia and I strongly suspect that she will shortly be doing her tribute to Faye Wray! It also occurs to me that Ardent's 'upgrade' nanobots may have been the thing that it's been waiting for all these years (although whoever put them in Ardent didn't know that). A giant monster able to transmute any object on contact? Not a nice thought! I wonder: what happens when Ardent's nanobots come in contact with other nanobots? There's a brief battle for dominance, then they go look at the moon. "duuuuuuude... have you ever like. LOOKED at the moon? I mean REALLY LOOKED"
Cracking use of a first post, sir. And damn, the Night Walker is creepy enough without a thousand more legs. Just a random thought: what if the wipeout wasn't perfect? What if the night walker is a collection of nanomachines from before the wipeout who formed a simple hive mind out of survival instinct? Perhaps nanotechnology was common prior to the wipe, and the wipe killed off most of the hives of nanomachines. The machines lack basic intelligence on their own, outside of "work with others and follow received tasks", and without a mind capable of interacting with them, such as Gavia or Ardent, are incapable of more. Since most hives were wiped out, the night walker was the culmination of the survivors who came together out of instinct. But with something like those minds, they can thrive. It's also possible that some of the machines are degrading after all these years, and they view Ardent and Gavia as a replacement population or repair potential. Also, why is it that the night walker's eyes were originally white, and now they're yellow? Hey folks. Been reading QC for years, and it's Alice Grove that gets me to register, go figure. Wasn't sold on it at first, but it's winning me over, rapidly. The reason I registered was because, I also read the forums regularly, and something has been driving me nuts. 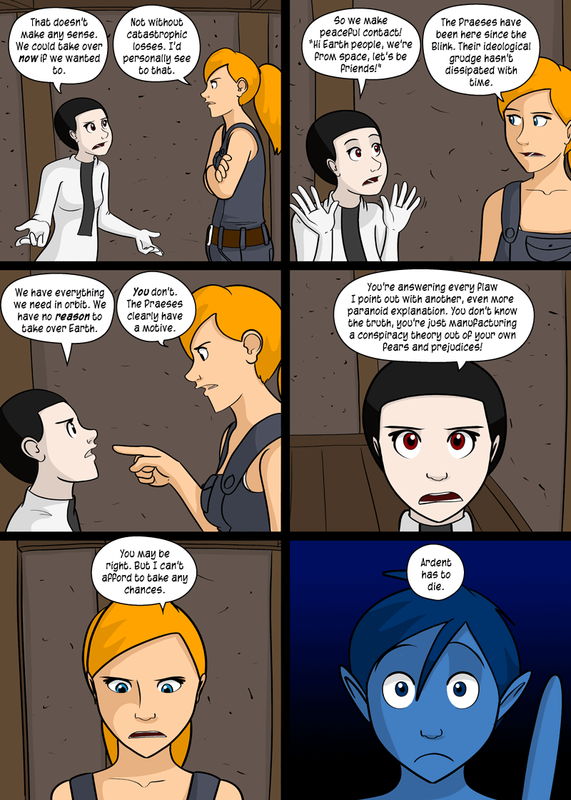 I don't mean to come in hot, but... don't we pretty much know exactly what Alice and Sedna are at this point? I just went back and did a full read-through in one sitting, and it seems pretty fairly spelled out, to me. "Long ago, humanity split into two factions. One favored the advancement of the species by enhancement through biological means. The other favored the development of artificial intelligence, to aid humanity and enhance it through its own methods. The AI faction pulled ahead - they created truly sentient artificial life, and began integrating it into their society. This led to a series of regional conflicts that finally escalated into all-out war. It lasted for years. Billions died." "I should know. I was a weapon too, once." Alice was on the losing side of a war where "billions died". Those in orbit were on the other side. I'm sure she's got some pretty darned unpleasant memories of that period of time. Her distrust and paranoia are understandable. Also seems like it would shed a bit of light on Alice and Sedna's relationship. They were comrades in arms, fighting a losing war. They probably went through some rough stuff together, that will keep them connected on some level no matter what disagreements they may have. I can't help but notice that they defaulted to sleeping back-to-back. Anyway, thanks for humoring me. I have a theory about what is going on in general, and where this story may be headed (and a theory about what the Nightwalker is that excites me very much), but I'm going to hang on a bit, and see what kind of feedback I get on the above first (this is already way more than anyone wants to read). Feel free to rip my speculation to shreds - I can handle it! Probably partly true. We'll find out eventually. Either way, welcome to the forum! The impression that I got was that the war was ended by a third party, now vanished and the current situation imposed upon the two parties. That's why there is still this feeling that the war could start again because nothing was ever really resolved. Someone just pushed the two sides apart and forced them to stop fighting. To be fair, Alice is the only one we have seen express that feeling - that the war could start again at any moment - so far. Gavia is equally convinced she's wrong. In any case, by "losing the war" I only meant "in the process of losing". I'm imagining that the biologicals were in pretty rough shape leading up to the blink. I may very well be wrong; Alice's monologue seems to imply that the AI faction "pulled ahead" in the time period before the war; she's not specific about any of the action of the war itself. Alice seems to be admitting that, though she wouldn't go quietly, if push came to shove, the orbital faction would likely win. If a third party truly wanted to create peace, and had the power to perform arbitrarily large and apparently instantaneous edits to an entire world and all its inhabitants, why would they allow to remain a power imbalance that would permit one faction to re-open and win the war whenever they felt like it (or create that imbalance, if the factions were approximately evenly matched beforehand)? Okay, I'm going to get further into my wild speculation below, if for no other reason than to get it on record, so I can pat myself on the back, or point at myself and laugh, later. (Also, I feel we may be getting some more information on some of it very soon.) This is a lot of text, and I won't be offended in the slightest if no one reads it. They are charged with keeping an eye on earthbound humanity, either just to make sure everything is going smoothly, and/or to make sure that they don't start to reach a level of technology that could be threatening to those in orbit / themselves / generally upset the current balance. This is why the Nightwalker has not done anything much for so long... until Gavia and Ardent came along. Their nanotech is the first instance down on earth of something that crosses the tech threshold to trigger the walker. The Nightwalker's role may be as simple as obliterating or quarantining any violating technologies, and alerting someone to the event. If I'm right, then the upgraded water pump could be a problem, and we may be getting a big red button press at some point here. From the very little we've seen of this world so far, it seems to me that the regulatory dynamic on earth and in orbit is actually quite similar: Down on earth, you've got a town of blissfully ignorant folks going about their daily lives, managed and watched over by an enhanced human. Up in orbit, you've got (if Ardent and Gavia are any indication) blissfully ingnorant folks going on about their business, watched over and managed by a sentient tree. My guess is that the AI faction won the war, after a fashion. That fashion being that it was the tools and weapons, the AI, that "won" - not the wielders. There was a singularity/run-away growth scenario, where the strongest and best AIs attained a level of intelligence and power so as to take complete control of human affairs. At that point, instead of wiping out their opposition (because they no longer needed to), they picked a third option, and re-ordered the world into the form with which we've been presented. Now, both populations are free to live in the way that seems best to them - one rejecting technological transhumanism and living as natural biologicals, and the other embracing technology and nano-tech self-modification. But, both populations are probably locked into an approximate period of history, and are not entirely free to develop further. Either the Praeses are the architects of all of this, or the AIs that were, left the Praeses and the Alices/Sednas behind as capable but ultimately limited guardians and managers of their respective populations. The Praeses (or the architects) identify the communities by their caretaker. Thus, "Alice Grove". So, the question is, why has the action of our story come to pass? There doesn't seem to me to be any reason at all for a re-opening of hostilities. Is a re-integration in the works? That would seem to jive well with Ardent's payload. After all, almost no one alive now was around when sides were taken and lines were drawn. If given the choice, some or many of those on earth may chose to rejoin the future. The Praeses may have just decided it's time to extend an "invitation". Alternatively, the Praeses could be maliciously attempting to activate the Walkers against the unsuspecting communities by placing triggering technologies in their midst (though it would seem a clumsy way of doing it). If the AI faction was really pulling ahead in the time leading up to the war, it may very well have been the biologicals that fired the first shot, sensing, and unwilling to accept, their own impending irrelevance. If so, Alice may have come to be fully aware that she did some very dirty things, in the service of a cause she's no longer completely convinced was right. There. I just threw a lot of crud against the wall. Let's see if any of it sticks. The problem with that theory is that there seems to be more evidence for the biological faction being in space. The praesides seem to be biological, and Ardent shows obvious signs of biological augmentation. Gavia has nanotech (as does Ardent), but seems convinced that sentient AI is impossible. It also doesn't explain where Alice's armor came from. Most likely to me is that both earth and habits contain a mixture of both factions. On the subject of the Nightwalker, I'd personally believe something closer to Alice's explanation, that they're just lost nanobots, but I have a feeling we're about to find out a whole lot about it so let's hold off there. However, I like your theory about the Praeses using the kids' AI to attract Nightwalker attacks. There doesn't seem to me to be any reason at all for a re-opening of hostilities. Alice said that the Praeses have held some unfading grudge since The Blink and want everyone on the ground wiped-out so they can "come down from orbit and reclaim earth"
I've long held the opinion that the sentient AIs were the cause of the Blink and that they were operating independently of the pro-technology human faction. Also, just being pro-technology/AI as a road forward does not make that faction unable or unwilling to use genetic augmentation. Even though it's not their choice of means to progress human society doesn't mean that they won't use it for medical or cosmetic reasons. FWIW, I suspect that those currently on Earth are made up of two groups: Those who had been neutral in the Great War and had just wanted to live their lives without needless complexity and those who had been abused and misused by the factions and would be better off forever out of their grasp, like Alice and the other Super Soldiers. @improvnerd, you're not wrong there. There's definitely no certainty at all that it is the biologicals on earth, or that the two factions were split up that way at all. I guess I'm just making that assumption since the majority of earth's inhabitants appear to be unmodified, and not have much in the way of technology at their disposal. Anyway, as for the point about Alice's armor, I don't see any reason why it would be a problem if it was non-organic. Just because the biological faction focused on biological self-modification, doesn't mean they'd instantly abandon use of all mechanical tools. One side puts a chip in their head to help them aim better, the other side biologically augments their eyes to help them aim better, but they're both still shooting guns. (Speaking generally here. Alice's weapon of choice seems to be her own two hands.) Basically what BenRG said - just because there was an ideological preference towards one type of technology doesn't mean there would be an absolute, hard and fast line, with no blurring or crossover. @mr.jacob, regarding what Alice said about the Praeses' ideological grudge: she basically admits it's guesswork. Alice: The Praeses have been here since the Blink. Their ideological grudge hasn't dissipated with time. Gavia: We have everything we need in orbit. We have no reason to take over earth. Alice: You don't. The Praeses clearly have a motive. Gavia: You're answering every flaw I point out with another, even more paranoid explanation. You don't know the truth, you're just manufacturing a conspiracy theory out of your own fears and prejudices! Alice: You may be right. But I can't afford to take any chances. I like the Alice character, and I think her heart is basically in the right place, but I think Gavia's criticisms are not entirely off the mark here. I'm not prepared to consider Alice an entirely reliable narrator at this point. This much I absolutely agree with. It's my theory, and I'm sticking to it, that there was a run-away AI scenario, and they ultimately took matters into their own hands. Edit: Ok, major point that just occurred to me. If both the orbital and earthbound populations are a mix of both pre-blink factions, then why would the Praeses have an "ideological grudge" against those on Earth at all? The only major ideological schism we've been presented with so far is AI faction vs. bio-mod faction. The only explanation I can see is that one faction stayed on earth and one wound up in orbit. And I can't see the earth dwellers having been the tech faction. Alice: So Gavia uses nanotech. Why don't you? Gavia: Technology has been the way humanity has interacted with the universe since before the dawn of time. By embracing it to the utmost, I am human in the truest sense. Ardent: Whereas I believer that technology insulates us from the universe. It prevents us from experiencing things as we were meant to experience them - through the senses evolution gave us. Alice: Evolution didn't give you blue skin, pointy ears, and a tail. Or the ability to regrow body parts. Ardent: There's nothing in the rules that says we can't help evolution along. That definitely reads as support to improvnerd's position. Edit 3: May be over-thinking some of this. It's been 5,000 years. There's no obligation of anyone alive now to have held fast to the ideologies of their predecessors. Alice/Sedna and the Praeses may have done so to some extent, but the populations at large are probably just folks living as best they can at this point. FWIW, my call is that the space-dwelling population can trace its ancestry back to both the bio-tech and synthetic-tech factions. However, over five millennia, there has been considerable cross-pollination of ideas and the distinctions between the two factions has faded away leaving a more homogeneous 'Spacebourne' society. The Earth-dwellers are not necessarily descended from anti-technology groups. They're just descended from those who did not feel strongly enough either way to support either faction (and those who supported neither). I have no doubt that the immediate post-Blink millennium involved a population crash on Earth. I doubt more than 20% of the population still on Earth post-Blink survived the loss of the technological infrastructure that delivered food, water, shelter and healthcare. The super-soldiers had likely their hands full at that time helping the various communities develop the basic strategies and resources needed to survive. Given that the Night Walker is attracted to Gavia/Ardent (I think Gavia), and has been staring at the Moon for a long time, surely the reason it stares at the Moon is because it detects nanobots in space? This is a longshot guess but I'm betting the Sentient AIs set up shop on the Moon (probably suitably below the surface) and the Night Walker, in its combined form, can pick up something from those facilities (maybe radio signals). It might even be that the Night Walker is one of many 'agents' the AIs left behind on Earth to monitor events and that the 'staring at the moon' is the transmit/receive synchronisation as it uploads its latest observations and downloads any new directives. Hum. I just do not understand the "ideological grudge" comment if it's not at least the case that Alice thinks the blink performed a segregation of the two pre-blink factions. Again, I do consider her judgment unreliable, so what she does or doesn't think may not reflect what's actually going on. In the intervening 5,000 years, the old ideological identities have faded, and someone is at least exploring the idea of a re-integration. I agree with BenRG that the architects were powerful AI acting independently. And I'm sticking to my prediction that the Nightwalker(s) are a high level observer/control mechanism. Alice: Do you ever wonder why, with all of your marvelous technology, there are no truly sentient machines? Gavia: It's just not possible. The Praeses think, but not like we do, and they're not really machines either. I read this as the Praeses having their origins in synthetic tech. 1.) Consider what Alice is asking in that first line. According to Alice, only one faction had "truly sentient artificial life". It is (to me) heavily implied that the biotech faction emphasized "advancement of the [human] species by enhancement through biological means", as opposed to developing entirely new and powerful forms of biological life. 2.) So, when Alice asks why there are not "truly sentient machines", she's not asking why there are no instances of peak tech from either faction - she's specifically asking about the AI faction. In that case, if the Praeses were biological in origin, it would seem strange to me to make such a trivially obvious comment as "they're not really machines". For example, if the conversation is about instances of strong AI, I'm not going to bother to make a point to disqualify myself - it's trivially obvious that I'm not eligible to be an example, by virtue of being biological. I think that, while the Praeses were given a physical form that is apparently reminiscent of organic life, they have (or, at least, once had) more in common with synthetics than biologicals. No big deal, it'll grow back in a few days.